Target Shooting, Inc. makes what may be the world’s best precision rifle rests. Case in point: the Model 1000. This Rolls Royce of rifle rests weighs almost 15 pounds–a good thing when it comes to precision work with a rifle. Built on rugged front and rear castings joined by two square steel rods, the Model 1000 has one rear and two front screw-adjustable feet with knurled locking collars. A bubble level in the front casting permits the shooter to obtain a perfectly level platform by adjusting the height the feet. Each foot includes a screw-out steel pin for use on wooden benches, with non-marring vinyl foot caps provided for hard-surfaced benches. Bed length is adjustable from 6 to 26 inches, more than sufficient to accommodate the longest rifle. The rear saddle is covered in soft black leather, and is adjustable for height, rotation, and fore/aft angle. The Model 1000’s forend cradle is truly a work of art. It rotates 360 degrees, and is micro-adjustable for height via a large, knurled adjustment ring. The rifle’s forend is cradled between two dead foam blocks, which kill rifle bounce and protect the forend. The width between the blocks can be set at up to 3.5 inches to fit the widest target forend, and when locked in they microadjust right and left using a large windage adjustment knob. I am very fortunate to have a shooting range right outside my back door, but most shooters do not enjoy such luxury. It was once that way for me also. I would have to pack up the guns, ammo, holsters, fried baloney sandwiches, and whatever else I needed to head off to a shooting range, or gravel pit, or just back in the woods. Once there, setting up a target usually meant a cardboard box with a rock in it. 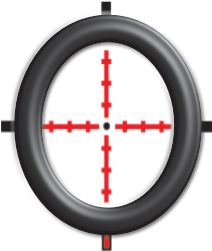 Even if you shoot at an established range, there usually are not enough target stands to go around, and you are back to the rock-in-a-box target. I once had a target stand that I made out of PVC pipe, and it worked pretty well, but was still bulky and cumbersome. Here we have the Model 200 target stand from Target Shooting, Inc. Like everything that they make, the Model 200 is overbuilt. It is made from steel and aluminum, and it folds flat for transport. This can be better seen in the video than I can describe it, but no tools are needed, and just tightening one knob sets the target upright, no matter how steep or uneven the terrain. All components of the Model 200 are replaceable, just in case someone shoots your target stand. I know that you would never do such a thing, but what about your shooting buddy? Anyway, the plate that holds the target can take a few hits, but when you shoot it to pieces, you can replace that as well. What I really like is that the Model 200 will support a tall target, getting the stand well out of the line of fire. I like the corrugated plastic lightweight material that is used for yard signs and such, but stiff cardboard, sheet metal, or thin plywood will work perfectly in the Model 200. It folds down flat, and takes up very little room, so it can be left behind the seat of the pickup or in the trunk of the car, always ready to go shooting. The Model 200 is a good investment in your shooting, and is a quality piece of American-made equipment. Check out the Model 200 target stand and other fine shooting aids at www.targetshooting.com. I first met Wally Brownlee of Target Shooting, Inc at the 2001 SHOT Show. There he was displaying his new rifle rest, which was called the Model 500. I was impressed enough to buy one on the spot, and have used it for many years. It still serves me well, even though I now also have the newer Model 1000, along with accessories such as the custom-made sandbags for the Model 1000 and the Target Shooting handgun rest. The 500 is still the best choice for some rifles, depending upon the action type and magazine length. For a couple of years now, Wally has been trying to get me out to South Dakota to try out his Model 2500 Shooting Bench. I have seen this bench displayed at shows for a few years now but had never fired off of one until last week. I finally made the trip, along with my cousin Melvin Kent. Most folks around here know him best as Dwayne, but I call him Melvin, as that is his first name. Melvin and I are pretty close as cousins go. He is a first cousin on both sides of the family, as his mother is my father’s sister, and his father is my mother’s brother. Anyway, even though he is a full ten years older than I, we do a lot of things together, and one thing which we have discussed for years is going prairie dog shooting together. I have received the question more than once; “Why would you want to shoot a cute little prairie dog?” While I will admit that they are cute as far as rodents go, ranchers hate them and want them removed from their rangelands and pastures. The dogs eliminate most of the vegetation around their burrows, and can quickly ruin many acres, with their burrows posing a danger to livestock. Anyway, when we arrived at the ranch in South Dakota, we were welcome guests. Where we were shooting was an area that had seen no recent shooting, but there were also other shooters in the small town of Martin that told of one rancher paying one dollar per dog to anyone that would shoot them. Arriving the night before we were to go out looking for prairie dogs, the rancher told us that they were having an informal calf roping on the ranch that night, so we gladly attended to watch cowboys, and a couple of cowgirls, compete with each other in a team roping competition. We called it a night around 10 PM, but heard that they were going until around 2 AM the next morning. It was a lot of fun to watch the skill of those folks doing what they grew up doing as if it was all pretty much routine to them. The next morning, we crawled out of our beds around 6 AM, got dressed, and headed out for breakfast at a place called Jennie’s. I don’t recommend it. The food was pretty good, but the service extremely slow. We were the first customers, but it was a full fifty minutes before the food started to arrive at the table, with the key word here being “started”. It was delivered in waves, instead of all at once. Anyway, the next morning we decided that donuts and coffee from the gas station was a better idea. Heading out of town on a gravel road for several miles, then on a dirt road for several more, we were greeted at the ranch by the owner, who looked as much like Peter Fonda as Peter Fonda does. Really nice fellow, who led us out to the vicinity of the dogs. Wally handled the set-up of the Model 2500 shooting benches, taking about five minutes to set one up properly. The Model 2500 transports handily in three basic sections. The base with the legs attached weighs around sixty-nine pounds, being made of heavy steel. It still handles very well, as the legs are folded for transport. Wally set up the base and using a small level, adjusted the bench to fit the uneven ground. At the base of each of the three legs is a pad to prevent the legs from burying into the soft ground, and the angle of the legs can be adjusted to precisely fit the terrain. After the base is in place, the table slides on, and it too is adjustable, to allow for any uphill or downhill shooting. Next, the seat attaches, and it is adjustable up and down to fit the desires of the shooter. The Model 2500 table pivots around its base a full 360 degrees. I found it very useful to slowly pan the area for prairie dogs looking through the scope on the rifle, as well as panning with the Model 2500 when using the binoculars. The table swings freely but has a brake that adjusts the resistance of the table for stability, and the brake can also be completely locked if desired. I left mine set up for just enough resistance for easy panning by pushing off on the footrests. While on the subject of panning the rangeland with binoculars and through the scope, we used Leupold optics exclusively on this shoot. On my Bushmaster Varminter and Cousin Melvin’s Ruger Mini-14, we mounted VX-L scopes. The dished out bottom on the VX-L makes it really the only choice for varmint hunting with a Mini-14, due to the high handguard over the barrel. The VX-L, even with its large objective bell, mounts low on the Mini for a better cheek-weld on the stock, improving the practical accuracy of the weapon. The Leupold scopes we used had the Varmint Hunter’s reticle, which proved to be very useful at extended ranges, with the reticle subtentions having windage hold-off points to make hitting much easier with the gusting winds. When looking through a scope or binoculars all day, good glass makes a world of difference, and the Leupold binoculars and scopes never caused any eye fatigue at all. I have used cheap scopes in the past, but if I can help it, I will never do so again. Quality optics cost more because they are worth it. The Leupolds never let us down, and never failed to provide excellent resolution, even out past 400 yards. I am not certain how many rounds I fired over the course of two days shooting, but it was several hundred. The scope settings never moved but remained precisely set to where I wanted. After the benches were set up on the first morning, the shooting was slow. There were prairie dog burrows on the hillside across from us, but very little activity. It was decided that Cousin Melvin and I would get into the Gunblast Suburban and go try to find some better ground. After checking a few places, taking a dog or two then moving on, we crested a ridge and looked into the valley below. Jackpot! There were burrows and dogs everywhere. Having left the benches behind with Wally and his video guy, Bob Saur, we shot a few dogs, resting our rifles on the truck. The wind was moving the truck, so I decided to go into a semi-prone shooting position, which was better, but the stability just was not good enough for hits much past 200 yards. After a dandy dinner (“lunch” for you folks north of the Mason-Dixon), we moved the benches and set them up in the newly-named Prairie Dog Valley. Once we were on the Model 2500 shooting benches, our hit percentage went way up. I could not believe what a difference it made. Panning the valley and the opposing hillside was easy, swinging the table towards a dog as soon as he was spotted. The bench, with the Target Shooting, Inc Model 1000 rest atop, was as stable as my heavy benchrest at home. The crosshairs of the Leupold would settle on a target, and stay absolutely still using the bench. The solidity of the shooting bench and the comfort of the shooting position allowed me to spot my misses through the rifle’s scope, and make windage and elevation adjustments instantly. I carried two AR-15 rifles with me on this trip; my Varminter and a new Anderson Manufacturing AM-15 with my Tactical Solutions can be attached to the muzzle. Both rifles performed splendidly using Black Hills and American Marksman Stryker ammunition. For the rest of the day, we shot prairie dogs constantly, only stopping occasionally to let the rifles cool. Melvin’s Mini got so hot that it was starting to lose accuracy, so a wet towel was placed over the barrel to speed the cooling. The Varminter’s fluted barrel cooled very well, as did the barrel of the AM-15. For this type of fast action, I really love the AR rifles. Between shots, there is no need to work a bolt or to even move the shooter’s eye away from the scope. Aiming corrections can be made instantly, and the twenty-shot mags that I prefer are both handy and reliable. Recoil is light, and the accuracy was superb using the ARs. Several hits were made out past 400 yards, even with the wind blowing. The bench that I was using had the optional canopy that Wally had just developed. It shades the shooter and his weapon from the hot sun, and the wind did not seem to affect it at all. It fastens securely to the bench top, so there is no extra time needed to set up the Model 2500 for shooting. The next morning we arose early, grabbing a quick breakfast at the gas station, and headed off to a different ranch, met once again by a friendly rancher who was glad that we were there. We once again found a good shooting area, but this time it was flatter ground than where we shot the day before. The benches really worked out well on that ground as well. Panning a full 360 degrees to acquire targets was very easy, and the stability of the rifles on the bench and rifle rest was as good as it gets. This Model 2500 bench really impressed me. I had expected it to be good, but I have used portable benches before, and they were sorely lacking in quality and stability. The Model 2500 was just like being on a heavy concrete bench at the range, except that the Model 2500 is a lot easier to use, more versatile, and much more comfortable. While the price of the Model 2500 shooting bench is higher than many of the cheaper benches available, it is because the Model 2500 is that much better. It offers rock-solid stability, extreme versatility, and absolute comfort. When figuring the cost of the bench against the cost of the trip, and considering that it will last more than a lifetime, the cost is minimal. The Model 2500 bench and all of Target Shooting’s products are made of top quality materials, beautifully finished, one hundred percent weather-proof, and are made in the USA. 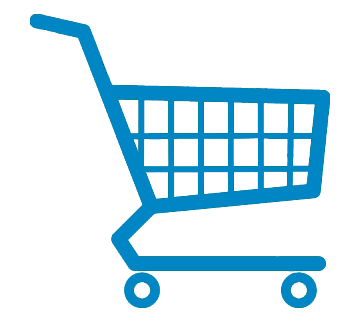 For pricing and ordering information, go to www.targetshooting.com. For a look at the quality Leupold optics, go to www.leupold.com. For a look at the Black Hills and Stryker ammo used on this shoot, go to www.black-hills.com and www.americanmarksman.com. Look for a review here soon on the high-quality AM-15 rifles from Anderson Manufacturing. By the way, in that picture of Wally cooking and us chowing down, the meat is not really prairie dog. We had decided on the way out to South Dakota that we would cook up a couple and try them, but when we bought our hunting licenses, the literature from the state warned against handling the animals, as they can carry the bubonic plague, which can be transferred to humans by fleas. Wally cooked up the best pork ribs that I have ever eaten, and I have stuffed a lot of ribs down my neck in my short life. Thanks, Wally and Bob, for the grub, the guidance, and the friendship. It was a good prairie dog shoot. The equipment made all the difference, and if I can help it, I will never go shoot prairie dogs again without a Model 2500 shooting bench. WATERTOWN, SD – Target Shooting Incorporated adds another new shooting rest to its successful product line. The model 1000 joins TSI’s line of high-quality, precision engineered shooting products. The model 1000 has many of the same features as the already popular 500 with increased adjustability and added features. The base is a cast, ferrous compound with a high-temperature silver-vain powder coating. This makes both the structure and finishes very durable. Half-inch, solid, cold-rolled stainless steel rods connect the forearm rest to but stock saddle. Length adjustment is fast and easily accepts any sized rifle. Pure shooters will appreciate the fine-tuning feature for both elevation and windage adjustments. A precise point-of- impact can be achieved without moving the entire position of the rifle and rest and the 1000 will maintain that point of impact after each shot unlike conventional sandbags or shooting rests. The 1000’s patented base design gives height adjustment at each foot. It can be leveled by horizontally fine-tuning each foot and with an integrated plumb bubble shooter’s can achieve perfect leveling. The feet of the 1000 have non-marring vinyl covers. These covers can be removed to expose Rockwell-hardened points for use on wood and concrete surfaces. The rifle forearm rests in silicone treaded blocks that are soft as to not mar the forearms finish and also solid enough for positive positioning of point-of-impact. The blocks are adjustable from 1 ¼”-3″ to snugly fit any width forearm. With the rifle in place, both windage and elevation can be adjusted without moving the rest base. The buttstock is cradled in a rear saddle that is covered with leather and has a built-in leather bumper. This rear saddle is height and tilt adjustable with an optional fine-tune height adjustment available as an added accessory. No other rest system holds a rifle as solid into place without risk of damage to the blued or stock finish. Most importantly, the rifle is protected and point-of-impact is maintained after the recoil of a fired shot, even for the heaviest of magnum loads. “The Infantry Center Instructors us the TSI rifle rest when training initial entry Soldiers here at Fort Benning, Georgia and take the rest on the road when conducting New Equipment Training (NET) for Army combat forces,” says Charley Pavlick, Senior Analyst/Camber at Ft. Benning. “Additionally, the Infantry Center Instructors have used the TSI rest during weapon and accessory integration, research, testing and evaluation,” he says. “One of the best rifle rests I’ve ever shot over comes from Target Shooting, Inc. It has enough adjustment to satisfy anyone but remains cleverly simple. It’s stone solid, easy to use and it babies your rifle. Obviously, this rest was designed by a shooter,” says Wayne van Zwoll, Special Projects Editor, Guns & Ammo Magazine. 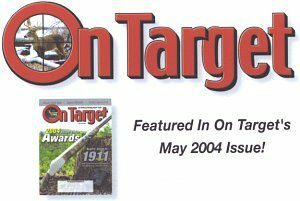 TSI is also proud to have its rest nominated for the “Editor’s Choice Award” of On Target Magazine. TSI’s model 1000 has several accessories available and many more in development. A sandbag attachment converts the silicone blocks to a conventional forearm rest, a rear saddle with fine-tune height adjustment, a bull vice to hold a rifle in place for gunsmithing, and a pistol rest for pistol shooting, and a gun stop. Available soon is a front V saddle and a specially designed rear base, making the 1000 legal for competition shooting. All these accessories make the model 1000 the most versatile found anywhere. TSI’s new model 1000 has the most precision features of any rest sold anywhere. As all TSI products, the 1000 was designed by shooters for shooters. To see the entire line of TSI products visit their website at www.targetshooting.com. as load development for some upcoming articles. There are a lot of good rests out there, but I may have just found the ultimate one. OK, what’s to get giddy about? Well for one thing, it weighs less than many other rests–just a bit more than 15 pounds. But that’s for the whole thing–front and rear rests. Once assembled, it is a one-piece unit, so that weight covers both ends. I’ve used sandbags for the front end that weighed more and were less stable. Another reason I fell in love with this conglomeration of threaded steel, iron and leather is that once it is set up–it takes maybe 30 seconds to put it on the bench and adjust it to the rifle you are shooting–the Model 1000 cradles virtually any rifle with absolute stability. There’s never even a hint the rifle is balanced precariously. How many times have you seen a rifle fall off a rest? A fully-adjustable fore-end stop ensures the rifle rests at the exact same point from shot to shot. To keep the stop screws from marring the threaded rods, a nylon ball is sandwiched between them. 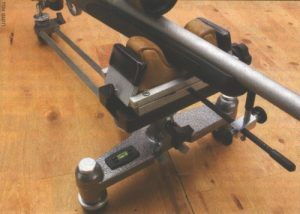 The spirit level mounted on the front rest allows the shooter to quickly level the rest on the bench. The workmanship on the Model 1000 is superb, making it one of the best rests available today. The Model 1000 consists of a cast iron front base in the shape of a T with threaded bases for adjustable feet and a central recess bored for the front bag assembly. A buttstock saddle connected to the front base by two 1/2-inch pieces of key stock makes up the tail section. Cast iron parts are coated with a silver-vein powder coating and the machined parts are made from stainless steel. The front rest is supported by a 3/4-inch threaded rod in a round, knurled adjusting nut with a roller bearing washer between it and another washer atop the base, making for a glass-smooth rotating action. A 5/16-inch hand screw serves as a stop to prevent the rest from creeping under recoil. At the rear a leather covered piece of angle iron is mounted on a fully adjustable 3/8-inch screw with a knurled adjustment nut similar to that on the front. Another hand screw allows the shooter to fine tune the fore and aft tilt of the saddle to accommodate the toe of the stock. There is a spirit level on the front T platform. The three feet of the rest are hardened stainless steel and come with non-marring vinyl covers which can be removed and tapped into a wood or concrete bench if desired. There are several fore-end variations available from Target Shooting, Inc., but I chose the sandbag because it is quicker and, for my needs, more versatile. A gun vise attachment is also available that can be used for cleaning and maintenance and there is even a rest designed for handguns. The sandbag rest has about 1 1/2 inches of windage adjustment, plenty for any foreseeable shooting need. A nylon friction washer retards it from creeping. Of course, on a premium rest like this, the sandbag’s ear tension is adjustable to accommodate a variety of fore-ends. And there is a fully adjustable fore-end stop at the front of the rest. On my rest, the leather sandbag is held in place with two pieces of 3/8-inch key stock and six socket-headed screws, for which Target Shooting, Inc. has supplied an Allen wrench cleverly tucked into a recess in the side of the front base. So how do you test a rifle rest? It’s not like I can tell you it shrinks groups. What I can say is it makes wringing out a rifle a lot easier than most conventional rests. Some full-support rests are so bulky and poorly designed that they get in the way of the shooter–especially a shooter who is already to bulky, like me. But this rest was designed by a shooter, Wally Brownlee, and he knew exactly what a shooter wants. It needs to support without being in the way; it needs to be lightweight and portable; and the adjustments must be full range, smooth, repeatable and not wander. After eight months of regular use with a lot of rifles and handguns, I’d say Wally done good…real good.